We are extremely grateful and remain indebted to our guide MR. E.mitra for being a source of inspiration and for his constant support in the Design, Implementation and Evaluation of the project. We are thankful to them for their constant constructive criticism and invaluable suggestions, which benefited us a lot while developing the project on “LIBRARY MANAGEMENT”. He has been a constant source of inspiration and motivation for hard work. He has been very co-operative throughout this project work. Through this column, it would be our utmost pleasure to express our warm thanks to him for their encouragement, co-operation and consent without which we mightn’t be able to accomplish this project. We also express our gratitude to Mr. E.mitra for providing us the infrastructure to carry out the project and to all staff members who were directly and indirectly instrument in enabling us to stay committed for the project. This project of “ LIBRARY MANAGEMENT” of gives us the complete information about the library. 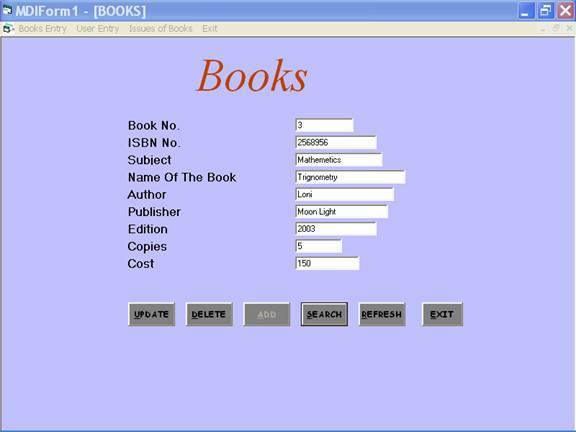 We can enter the record of new books and retrieve the details of books available in the library. We can issue the books to the students and maintain their records and can also check how many books are issued and stock available in the library. In this project we can maintain the late fine of students who returns the issued books after the due date. Throughout the project the focus has been on presenting information and comments in an easy and intelligible manner. The project is very useful for those who want to know about Library Management System. 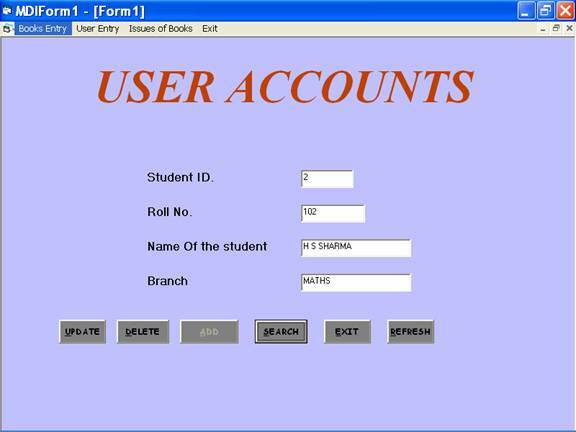 The Library Management System is designed & developed for a receipt and issuance of books in the library along with the student’s details. The books received in the library are entered in Books Entry form and the new student is entered in the student entry form. When the student wants to get the desired book the same is issued on the availability basis to the student. The issuance and due date for the returning of the book is also entered into the Book Issue form under third menu Book Issue. The student has to pay the fine if any on the basis of no. of days delayed deposit of the book in the library. Visual Basic is Graphical Rapid Application Development (RAD) tool that aims at providing the user with a graphical interface that is intuitive and easy to use. Visual Basic is a popular programming tool that can be used to write any kind of visual application ranging from a game to a database management application. Now-a-days Visual basic is being widely used for developing different types of applications and performing various types of jobs. With Visual basic, one can automate everyday tasks, add custom required features and functions to suit ones need, and create applications, which makes task easier. A visual Basic programming environment provides all features that are required to develop a graphical user interface as ready to use components. The Visual Basic programming environment is also called Point and Click environment. The programmer does not have to write the code to create and display commonly required user-friendly features each time around. When the programmer needs a specific user interface feature such as a button, he selects the appropriate ready to use component provided by the Visual programming environment. These components can be moved, resized and renamed as required. So a Visual programming environment automates the process of creating the user interface by designing Visual interface using the ready to use components. In addition, it also provides the means of associating the user written logically defined code with the components used in a project. My project on “Library Management” deals with the transaction happenings in Library in an organization/institute. interface as ready to use components. The programmer does not have to write the code to create and display commonly required user-friendly features each time around. Such as a button, he selects the appropriate ready to use component provided by the Visual Programming environment. These components can be moved, resized and renamed as required. Also there is no restriction on number of controls placed in the project. The interface components provided by the Visual programming environment has some code built into them. For e.g., a button ‘ Knows’ when it has been clicked upon and then when the event occurs, it executes the appropriate code. Visual Basic recognize following six types of variables as Numeric, String, Boolean, Date, Object, Variant. Integer Variables are used for the Non Fractional Values. It stores values in the range from – 32768 to 32767. Long Data type is used for the range –2147483648 to 2147483647. Single Data Type is used for Fractional Values from –3.402 e 38 to 1.40 e 45. Double Precision Floating Point Numbers is capable of containing values from –1.797 e 308 to 4.940 e 324 and positive numbers. Currency is used for fixed-point numbers with four decimal digits. It can represent numbers in the range –922377203685477.5808 to 922377203685477.5807. Byte data type is used for representing numbers from 0 to 255. String variables are used to store string type data. Boolean Data Type stores True/ False values. Boolean variables are used in testing conditions. Date and Time variables are stored internally in a special format, but you don’t need to know the exact format. Date variables are declared by following statements. An object variable is used to refer any object in the application they are declared by the object data type and after that they are set to any of the object in the applications with set command. In addition to above different Update, Delete, Add, Search, Refresh and Exit command buttons have been provided in the form. 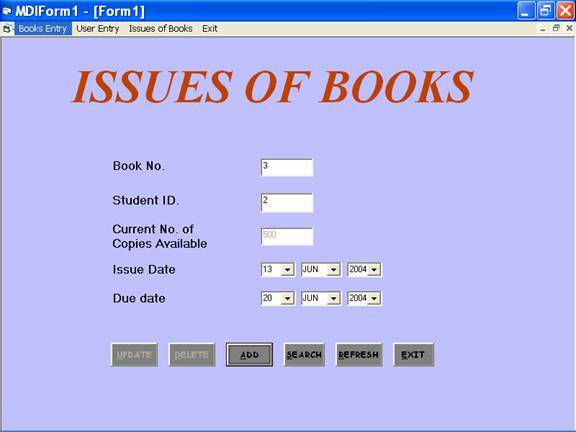 This form can be obtained by clicking the “Issues of Books” under the third menu “Issues of Books” for issuing a particular book available in the library along with the issue and due date. The following text boxes have been provided for entry of Issuance of the Book. 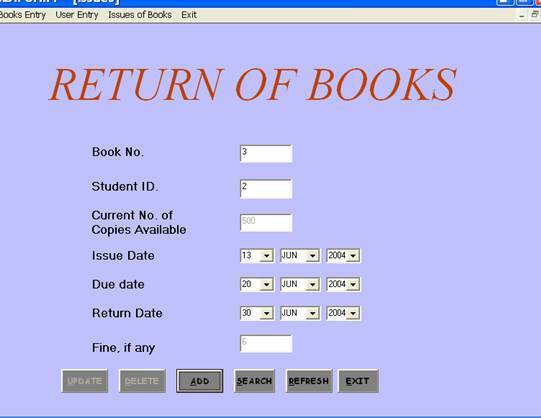 This form can be obtained by clicking the “ Books Return ” under the third menu “Issues of Books” for returning a particular book issued to user from the library along with the issue , due date and return date with fine if any. The following text boxes have been provided for entry of return of the Books. After we have completed the project we are sure the problems in the existing system would overcome. The “LIBRARY MANAGEMENT SYSTEM” process made computerized to reduce human errors and to increase the efficiency. The main focus of this project is to lessen human efforts. The maintenance of the records is made efficient, as all the records are stored in the ACCESS database, through which data can be retrieved easily. The navigation control is provided in all the forms to navigate through the large amount of records. If the numbers of records are very large then user has to just type in the search string and user gets the results immediately. The editing is also made simpler. The user has to just type in the required field and press the update button to update the desired field. The Books and Students are given a particular unique id no. So that they can be accessed correctly and without errors. Our main aim of the project is to get the correct information about a particular student and books available in the library. The problems, which existed in the earlier system, have been removed to a large extent. And it is expected that this project will go a long way in satisfying users requirements. The computerization of the Library Management will not only improves the efficiency but will also reduce human stress thereby indirectly improving human recourses.